About Us - B & M Patel Hardware Limited - Distributors of Davey, George Fisher Piping System (+GF+) and General Electric (GE) at Queens Road, Nakavu, Nadi. P.O. Box 800, Nadi, Fiji. Welcome to B & M Patel Hardware Limited. The Business is owned by Manish Patel & Brijesh Patel who has a respected history in Nadi & Fiji wide, owning this business within the local area over the last 35 years and is involved within the local community thru local service clubs and charities. B & M Patel (Hardware) Ltd is a store designed to cater for the Fiji Island lifestyle and as such caters towards both our rural and outdoor living lifestyles. With hundreds of items from reputed local & multination suppliers on hand, we cater for both the man on the land including broad acre and small niche farmers, the home gardener, resort owners and manufacturers with their wide range of water solutions from Davey (Australia). 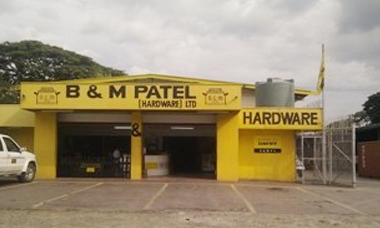 B & M Patel (Hardware) Ltd. is a family owned business located on the Queen's Road Nakau Nadi, Fiji Islands only five minutes drive from Nadi town & 15 minutes from Nadi Airport. The Business is owned by Manish Patel & Brijesh Patel who has a respected history in Nadi & Fiji wide, owning this business within the local area over the last 35 years and is involved within the local community thru local service clubs and charities. B & M Patel (Hardware) Ltd is a store designed to cater for the Fiji Island lifestyle and as such caters towards both our rural and outdoor living lifestyles. With hundreds of items from reputed local & multination suppliers on hand, we cater for both the man on the land including broad acre and small niche farmers, the home gardener, resort owners and manufacturers with their wide range of water solutions from Davey (Australia). We are affiliated since our establishment with Davey Water Products an ISO certified manufactures and distributes a comprehensive range of products for transfer, conservation, treatment and filtration of water and a leader in Australian and New Zealand market along with export business relationship with 60 other countries meeting their needs for toughest environmental and climatic conditions. We are sole distributors of Fiji and other Island countries like Samoa, Republic of Kiribati, Nauru, Vanuatu, Tonga and Cook Island.